Where to now for Germany? You are here: Home ∼ Where to now for Germany? 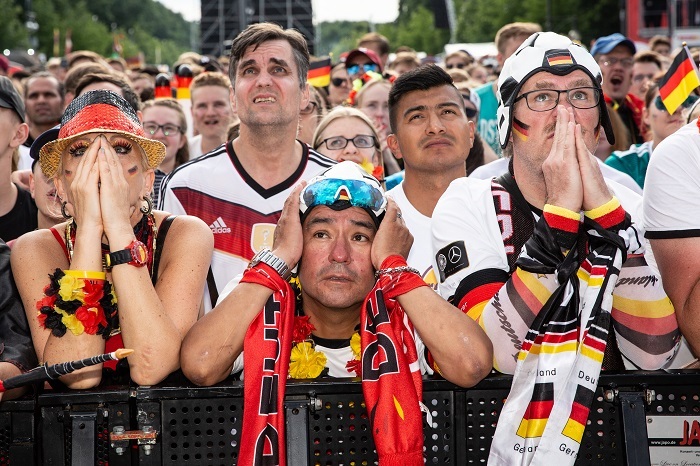 Germany fans react to their teams elimination. The curse of the defending champions has struck again as Germany have been sent packing from the World Cup, but where to now for Die Mannschaft? DEAN WORKMAN explores. For the fourth consecutive tournament, the defending world champions have been knocked out at the group stages. Joachim Low’s team were undoubtedly one of the pre-tournament favourites, and why wouldn’t you back the Germans, because they always perform at major tournaments, right? Wrong! The Germans, after a damaging 2-0 loss to South Korea which ensured they finished bottom of their group, have been knocked out at the group stages for the first time in 80 years. It was also the manner of their exit that has shocked so many. Die Mannschaft only managed two goals all tournament, the second fewest managed by a defending champion in the competition’s history, only ahead of France’s zero in 2002. Low’s men also failed to score in two of their three World Cup games in 2018, as many as their previous 15 World Cup matches combined. How can European giants Germany, who have a squad packed with some of the world’s best talent, perform so badly? The word that comes to mind is ‘complacency’. Low has been in charge of Germany since 2006, and while he has been extremely successful during his tenure, the players may have needed a fresh set of ideas, and a new pair of eyes heading into the World Cup. There has seemed to be too many players in the team who achieved untouchable status under Low, and perhaps that contributed to the poor showing in Russia. Possibly a different manager, who would have had a different relationship with the players, might have been able to get more out of the squad while not letting any fragment of complacency slip in. While the noise coming out of the German camp suggests Low might retain his job, surely a new manager has to be on the agenda. Low’s come under a lot of criticism for his decisions at the World Cup. First, it was the inexplicable decision to leave out the Premier League’s PFA Young Player of the Year in Leroy Sane. Then the former VFB Stuttgart manager received backlash over his team selection in Germany’s 1-0 loss to Mexico in their opening game. But this Germany side is not old or over the hill by any means. The majority of the squad are in their prime years, which makes their failure even more astonishing. This, however, will not be the case when the next World Cup in Qatar kicks off. The Germans will thus need to reinvigorate the squad with young talent and new ideas – something which I am not sure that Low is up to. One thing is certain: the German FA will not accept this failure and the planning for 2022 has most likely already begun.